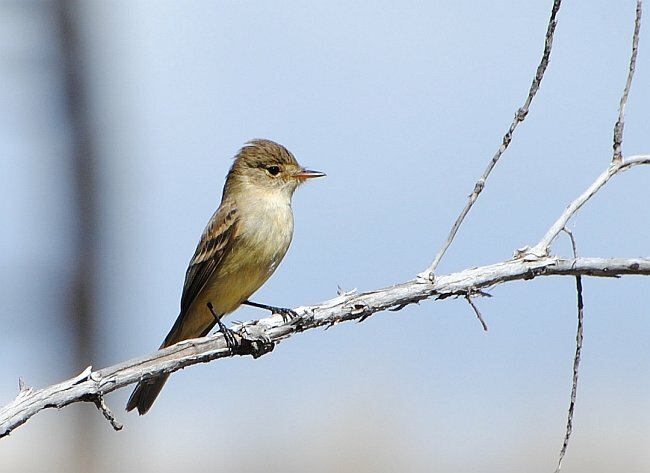 The Durango Highway is arguably one of North America’s great birding roads due to the great variety of habitats, the spectacular mountain scenery of the Sierra Madre Occidental, and the numerous Mexican endemics one can target. Thus, I looked forward to this second portion of the trip with great anticipation. After finishing up near San Blas (and unsuccessfully searching for Rufous-necked Wood-Rail), Andrew Spencer, Nathan Pieplow, and I continued our journey to the low foothills where the Durango Highway commences. These arid hills, cloaked in a mosaic of deciduous scrub and desert vegetation, form a northern outpost for several Neotropical species while also harboring several key endemics and southwestern Nearctic species. Think Arizona meets Costa Rica with a Mexican twist. This is where Gila Woodpecker and Yellow-breasted Chat meet Squirrel Cuckoo, Bat Falcon, and Black-throated Magpie-Jay. There are many dusty side roads in this area, many of which offer productive birding. For our first afternoon, we chose Panuco Road where we quickly connected with a cooperative Elegant Quail. As Andrew and Nathan focused their attention on this golden-tasseled gamebird, I wandered over to the next curve in the road where I encountered a cooperative Lesser Roadrunner crunching on a cicada. 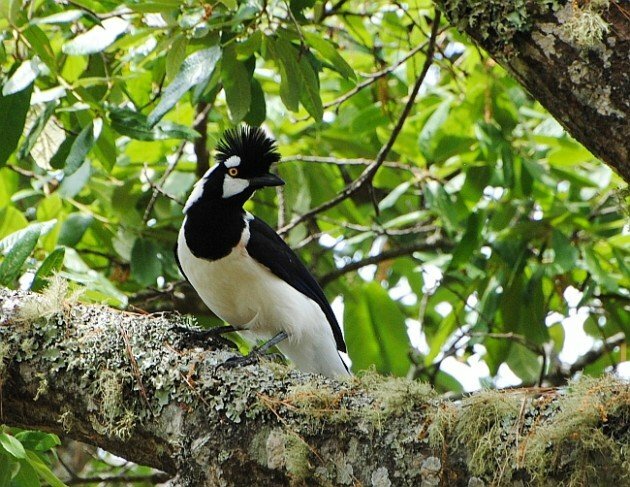 In the mean time, a family group of Black-throated Magpie-Jays were frolicking in the breeze high over the dry valley, showing off their exorbitantly long tail streamers. As the sun began to set, a flock of Mexican Parrotlets alighted in a tree with brilliant red bark, and we all noticed a Bat Falcon watching silently from a high perch above all the action down below. We decided to call it a day and made our way to Mazatlan for the night. 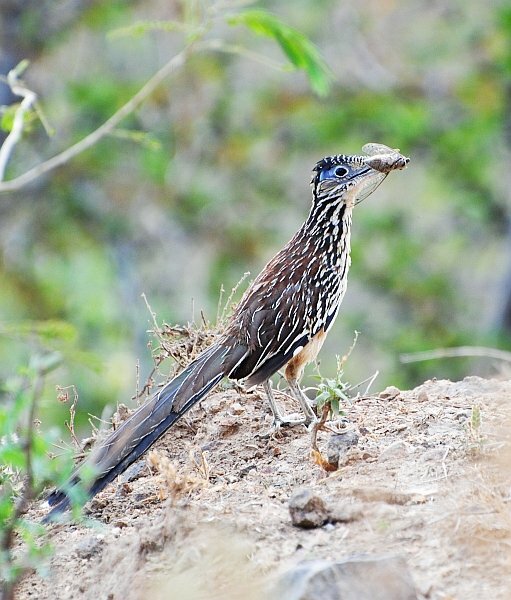 Lesser Roadrunner with a cicada. The next morning, we agreed upon visiting Camino La Noria, a reliable site for the endemic Purplish-backed Jay. Arriving at dawn, we were able to catch the last round of notes from a Buff-collared Nightjar. As the sun rose, it quickly became clear that there were a lot of hummingbirds along the stretch of road where we stopped (mostly Broad-billed and Cinnamon Hummingbird). Elegant Trogon was also absolutely abundant, and we heard and saw many individuals. We all wandered off to different points along the road at this point, and I walked for about half a mile before literally bumping into a vocalizing Purplish-backed Jay. I ran back to grab Andrew, and we were soon watching this large jay busily going about its routine of collecting food and flying off (presumably to a nearby nest). Dry and dusty Camino La Noria. Mission accomplished, we headed back onto the Durango Highway. 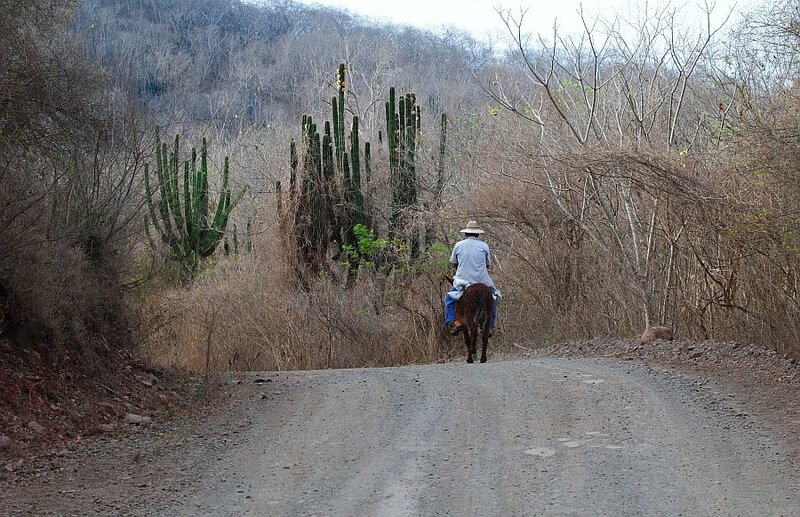 The dry foothills quickly gave away to the stately forests of pine and oak of the Sierra Madre Occidental. It did not take long before we had a family group of Tufted Jays right by the side of the road (KM 216) and an uncommon Gray-collared Becard at the same spot. These striking and inquisitive jays were perhaps the bird of the trip for me, and we took our time to soak in the experience of encountering these wonderful birds. A little further along the road, we stopped at a stake-out for Sinaloa Martin. This poorly documented swallow is a breeding endemic to these high mountains. The birds we observed were nesting right into the cliff face. There are not too many photos of Sinaloa Martin. Photo by Andrew Spencer. We had reservations at the Tufted Jay Preserve (Reserva Chara Pinta) for the night. Having already seen the jay, we took a more leisurely approach to our birding the following morning. As yesterday, we decided to scatter ourselves throughout the trails that lead away from the cabins. I really wanted to see Gray-crowned Woodpecker and Military Macaw, and I managed to succeed on both counts. Although they did not offer terribly close views, the macaws were absolutely spectacular as they flew back and forth across the valley. Otherwise, the birding here was strikingly similar to southeast Arizona: Mexican Chickadee, Brown Creeper, Painted Redstart, Yellow-eyed Junco, etc. Some odd additions more typical of South America’s avifauna included Elegant Euphonia, White-striped Woodcreeper (chickadees in the same forest as woodcreepers is just weird), and Green-striped Brush-Finch. Mexico is great for those who love biogeography! 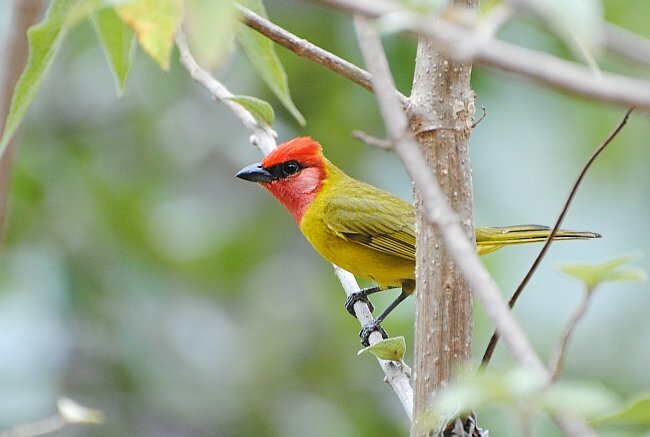 Red-headed Tanagers are just such pretty little birds — and a Mexican endemic! Around noon, we packed our bags and headed to a site (Cienega de los Caballos) where Noah Strycker had seen Eared Quetzal just a few weeks prior. The landscape and birds along the road continued to change, and I felt like we were traveling through Colorado rather than Mexico at this point — the various tropical species were almost all gone, replaced by Chipping Sparrow, Common Raven, Killdeer, and others. Although we failed to connect with the quetzals at Cienega de los Caballos, Andrew did flush many Montezuma Quail at various points along the trail. I had point blank life views of this tricky species from within a few feet. 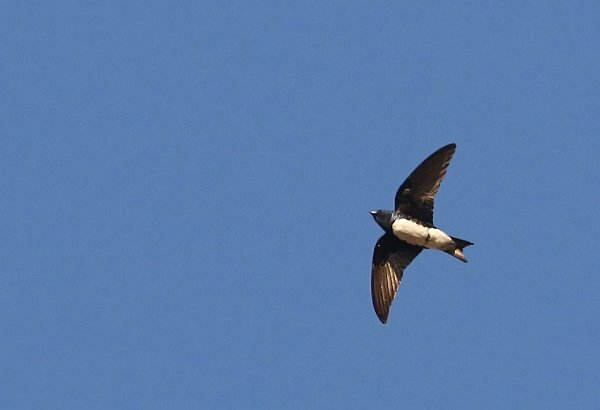 Another highlight was a brief flyby of a White-naped Swift, the largest swift in the Americas and possibly the world. The timidus subspecies of White-throated Flycatcher at Parque Ecologico El Tecuan. We had a really tight schedule the next day: Black Swift breeding colony at Mexiquillo, White-throated Flycatcher in a grassy swale surrounded by pine forest at Parque Ecologico el Tecuan, and Black-backed Oriole at Parque Guadiana in the city of Durango itself (the end of the road, so to speak). The incredible similarity of the Mexican Plateau’s avifauna to the Nearctic is what struck me the most. Townsend’s Solitaire, Western Bluebird, Curve-billed Thrasher, Bushtit, Golden-fronted Woodpecker, American Robin, Spotted Towhee…I could go on and on about what makes our birding experiences and landscapes so similar. The Durango Highway offers a chance at some of the most attractive and desirable Mexican endemics in some breathtaking mountain scenery while also offering a learning experience on the great similarity we share with our southern neighbor. Such an interesting mix of birds and habitats! So, when you three spread out to different trails, were you able to keep in touch by phone, or did you have to yell and run when you found a good bird? HI Donna! No yelling, but I did make a couple mad dashes to get them over to what I was seeing. We pretty much ended up with identical trip lists, in the end. Sadly, we did not see Sierra Madre Sparrow. According to our sources, the traditional stake-out no longer had any of the aforementioned sparrows. Thanks for the sad news, Carlos. Did your party stop and have a listen? Sadly, we just did not have the time, and the reports seemed so negative. We made no attempt for them. Fun read about the awesome birding in that beautiful part of Mexico. Where Are You Birding This Fourth Weekend of September 2015?